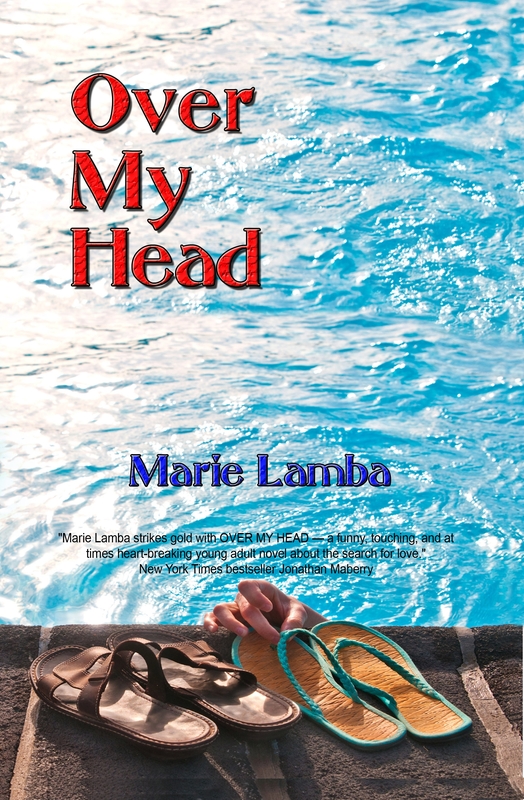 High school senior Sang Jumnal puts her heart on the line for college-aged lifeguard Cameron. But is she looking for true love in all the wrong places? Can her heart be wrong? *If you like The Summer I Turned Pretty by Jenny Han, and novels by Sarah Dessen, then you’ll love Over My Head, with its summertime vibe and realistic, heartfelt conflicts. The phone rings. “Got it!” I shout, and pick up. “Is Sang there?” Cameron says. “I got it, Dad,” I say. “Who is calling please?” Dad says. “Who is calling?” he persists. I hang up, race down the steps, and find Dad on the phone in the kitchen. “Um.” My mind is racing. I try to picture how it will go. Cameron will pull up in his Mustang. Strike one. He’ll meet my dad, who will see he is older than me. Strike two. Dad will ask Cameron absolutely mortifying questions, and Cameron will know then and there that I am not worth the hassle. Strike three, and you’re never going out! “You can come to my house, I guess.” Why can’t I think of another way? There has to be one. “Or we could just forget it.” Yes! Better to skip this horrible experience altogether. “I suppose I should thank you for saving my daughter’s life,” Dad says. “What’s that supposed to mean?” Dad asks. “Cookie?” Mom says, handing a plate of store-bought chocolate chip cookies to Cameron. He takes a cookie, and a crumb falls to the ground. I see my mom staring at the crumb, and know she is fighting the urge to pick it up. Poor Cameron. I can tell he’s gone through some effort to look extra neat. His hair is still damp from a shower, and even from my seat across from the couch I can smell his spicy cologne. He must really like me. Why else sit sandwiched between two staring parents if he doesn’t like me? But will any of this matter if my dad doesn’t like him? I remind myself about what Raina said. If things get really negative, I should do what she always does with her parents: nod, smile and pretend to agree with everything they say. Don’t make my parents angry. Act like I’m the all-dutiful daughter. Then I can sneak off and do what I want. I seriously think I’m going to scream. I grab a cookie from the plate and fill my mouth. I finish the cookie and grab another. “Hu-hum!” I clear my throat and shake my head. I take one more cookie and munch. “Doesn’t that sound responsible, Akash?” Mom says. “You mean, you plan to go there,” Dad says. Oh God. Here it comes. Another cookie goes in my mouth. “Cookie?” Mom says, offering Cameron the now-empty plate with a shaking hand. I wipe crumbs from my chin. It’s like watching an accident in progress. I can’t bear to look, yet I can’t turn away. “So that makes you how old?” Dad asks. “TWENTY!” Dad springs to his feet. “He’s just turned twenty,” I offer. “You never asked,” I say. “My, indeed,” Dad says, crossing his arms. I catch Mom’s eye and give her a pleading look. “Thank you, Mrs. Jumnal,” Cameron says sweetly. Dad takes a few deep breaths. “Well,” Dad says at last, “I appreciate you coming.” He holds out his hand to Cameron. Cameron gives me a pained expression. I can’t bear this. I can’t. I sprint to my room and stand there, fists clenched. I force myself not to scream—not to kick my wall or smash my mirror. Downstairs, I hear the front door close. Outside I hear Cameron’s engine rev. He’s probably driving straight to Trish’s where there are no parents and no 16-year-old children to deal with. I think about this for a moment. And grab my purse. Great excerpt – when will it be released – my daughter loved your first book and cant wait to read this one. Thank you so much for doing the Girl Scout Program in Tamaqua last weekend. It was excellent and many of the girls have finished your book already. As of now there is no set publishing date for OVER MY HEAD, but the world of publishing is ever changing, so hopefully this manuscript will find a home very soon. If you subscribe to this blog site (or if you folks added your email to my list at the Tamaqua event), you’ll get good news about publication as soon as I hear. Thanks so much for your kind words, Nancy! Is this a sequel to What I Meant? Whoo hoo – my girl scouts will be so excited to hear that Over My Head is slated for summer release – YEAH – we will be waiting!!! 🙂 I’m just telling the world TODAY. Very excited too! Tell everyone I said hi! I don’t know how I missed your comment. My bad! Thanks so much 🙂 Kindle version of this book going live this week…with the print version right after it. Wow……..I really want to read this book! I just finished reading What I Meant! CANT WAIT! !